Crust punk girl what do you see? 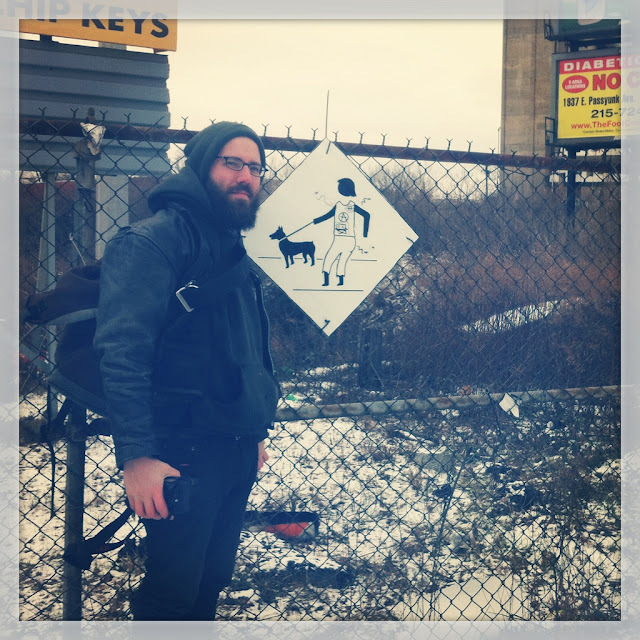 Just you and me and your dog crust punk girl"
Now officially more dependable than the United States Post Office; the crust punks of Grays Ferry can be seen 7 days a week in all types of weather. Faithfully standing guard with hands outstretched asking you for money during your daily commute. Some welcome these drifters with dollars and donuts; eager to hear stories of their freight train adventures. Others wonder why these perfectly able citizens do not get jobs and theorize on how they afford their fancy tattoos and piercings. No matter your opinion, we here at Gorilla Upskirts have made sure that all commuters will now be adequately warned when arriving at a designated Crust Punk Crossing area. So either roll up them windows and lock those doors, or dig out a dollar and a dog biscuit. Yoni channeling his inner crust.